You know the ancient joke, where someone asks, “Do you want a book for your birthday?” and the response is, politely, “No, thank you, I already have a book”? Had you asked me, “Would you like a CD with ten songs, none of them known to you, in a genre that you aren’t familiar with, performed by a group with only three musicians people you know (or know of)?” it would have been very easy to pretend to be busy cleaning up the kitchen and ignore the question. But oh! would I have deprived myself of immense pleasures because of suspicious narrow provincialism. The evidence is here: Charlie Halloran‘s new CD, devoted to music that isn’t officially “jazz” but that swings irresistibly down new paths. Charlie’s summary is worth quoting in its entirety: Excited to release my new album of Caribbean music! Recorded straight to 78 rpm acetate disc, 1950s era biguines to liven up a cocktail party. Bottoms up! And here you can enjoy the rhythms and sounds of this CD. Charlie Halloran, 2017. Photograph by Jeffrey Dupuis. I knew Charlie as a splendid trombonist and bandleader — this is his first CD as a leader. So, without even hearing this CD, I wanted a copy because I have faith in Charlie as an intuitively gratifying creator of music. And when I learned that the music had been recorded to 78 rpm acetate discs at Twerk Thomson’s studio, I knew it would be special. (Here is the lowdown on Mr. T.) The disc turns out to be a wonderfully rewarding travelogue and time machine: taking me places both musical and emotional that are very pleasing: hotel bar in the Caribbean, say, seventy years ago, as one of the people commenting on the disc has said. I don’t know anything about the vernacular music of Martinique; I don’t know the names of the dances the songs inspire; I’ve never had a Planter’s Punch, and I certainly don’t even want to type the song list — so I hereby disqualify myself from any pseudo-informed comment. But I assure you I’ve been wiggling in my computer chair, and if I had someone who was interested in wiggling on a more lavish scale, I wouldn’t be typing now, as this frolicsome music plays. And I will say that someone interested in the multi-cultural roots of New Orleans music will find much to notice, study, and love here. This post is shorter than usual not because of a lack of enthusiasm — no, quite the reverse! — but because I’d rather people hear the music than spend time reading my words. Aside from Charlie (trampagne — his preferred spelling — and instigator), the musicians are Tomas Majcherski, clarinet; Zayd Sifri, percussion; Pete Olynciw, string bass; Doug Garrison and Robin Rappuzi, drums; Tom McDermott and Shaye Cohn, piano; Max Bein-Kahn, guitar; Todd Burdick, banjo. It’s a wonderful disc, full of pleasures. And for me, who sometimes feels hemmed in by similar repertoire, it is refreshing and inspiring. It’s taken me a few months to write anything about Emily Asher’s Garden Party’s first full-length CD, but it’s taken me that long to wrest the disc out of the CD players — car, home, and office. The cover artwork by Jocelyn Curry is a lovely evocative introduction to the music within — full of beautiful surprises that quickly seem friendly and welcoming. I’ve admired Emily as a trombonist / singer / arranger / composer for some time. I first encountered her as an eager and skilled young player who came by for the second set at The Ear Inn to happily swell the ranks — and I first captured her on video at the very start of 2011 — a joyous jam session here. I wouldn’t call myself an early adopter of new technology, but I caught a young version of Emily’s band, the Garden Party, at Radegast Bierhalle in September 2011: the energetic experience comes through here. When the Party released a mini-CD Hoagy Carmichael tribute, CARNIVAL OF JOY, the disc was aptly titled. History, however, is not always the only offering of the Garden Party. Yes, they can swing out on WHEN YOU WORE A TULIP in fine New Orleans style, and the band’s knowledge of traditional and swing genres includes not only the familiar (ROYAL GARDEN BLUES) but the by-now-slightly-exotic (EMPEROR NORTON’S HUNCH). The Garden Party, however, is more than a band of youngbloods playing old favorites. And their new disc does have TULIP, BIG BUTTER AND EGG MAN, I’VE GOT A FEELIN’ I’M FALLING, MEMPHIS IN JUNE, and the little-known WALK IT OFF (recorded by Carmichael in 1946) — but the remaining five titles are originals by Emily or by the band. I won’t delineate the other nine tracks in this fashion, but MEET ME IN THE MORNING is a delightful tonic as well as a delightful corrective to some more tired (although “modern”) jazz conventions — the apparently endless string of solos over a rhythm section, the idea that modernity means turning one’s back on sentiment and swing. The music heard on this disc (or on live gigs) benefits from a deep study of what has come before, but it is not weighed down by pure intellectualism. Rather, the Garden Party knows and embodies what it is like to have fun with music — to Play without being goofy, to entertain a crowd, real or imagined. They do not disdain their audience, and their pleasure at making melody and swing comes through the little plastic artifact. And they are not jazz snobs — there’s a country waltz on this disc, and Emily’s version of a Fifties soul hit (that starts with a scratchy-78 version of the verse) . . . amusing and convincing evocations of a wide range of fulfilling music — each track a small pleasing present to unwrap more than once. 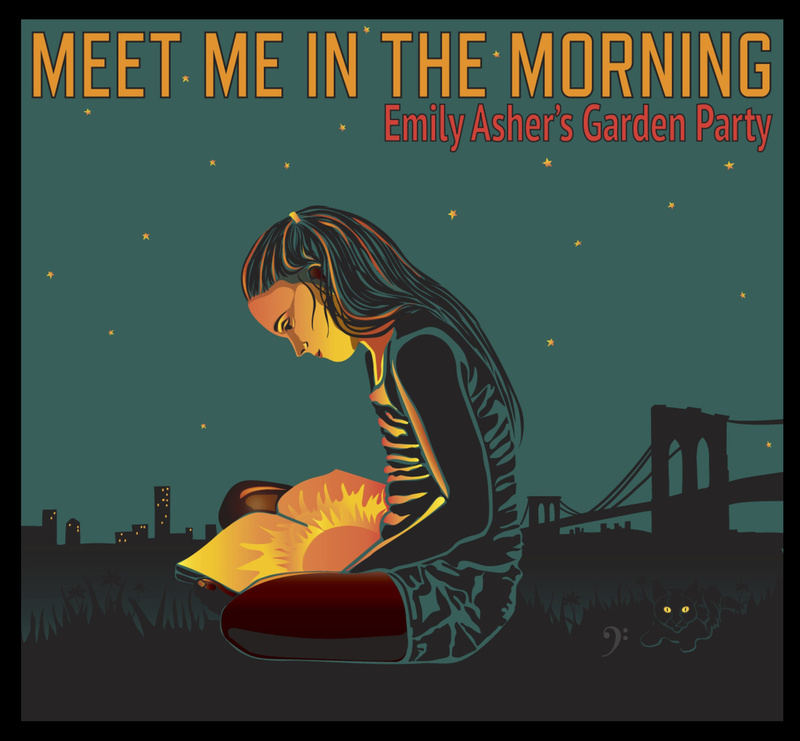 Emily’s bands have always had first-rate players and singers who seemed to blossom because of the warmth and light she herself brings to the music, but this version of her Garden Party is special. I will leave the adjectives to you, but here are the facts: Emily, trombone, vocals, composition, arrangements; Mike Davis, trumpet, fluegelhorn, cornet, arrangements, vocals; Tom Abbott, clarinet, alto saxophone; Dalton Ridenhour, piano; Nick Russo, banjo, guitar; Sean Cronin, string bass, composition, arrangements; Rob Adkins, string bass, arrangements; Jay Lepley, drums, arrangements, vocals. Nice recorded sound and fine notes from the Dipper himself, Ricky Riccardi. If you follow the Garden Party (on either coast and sometimes in the middle), you’ve already purchased a copy of this CD. If not, it’s an open invitation to joy. Details here.